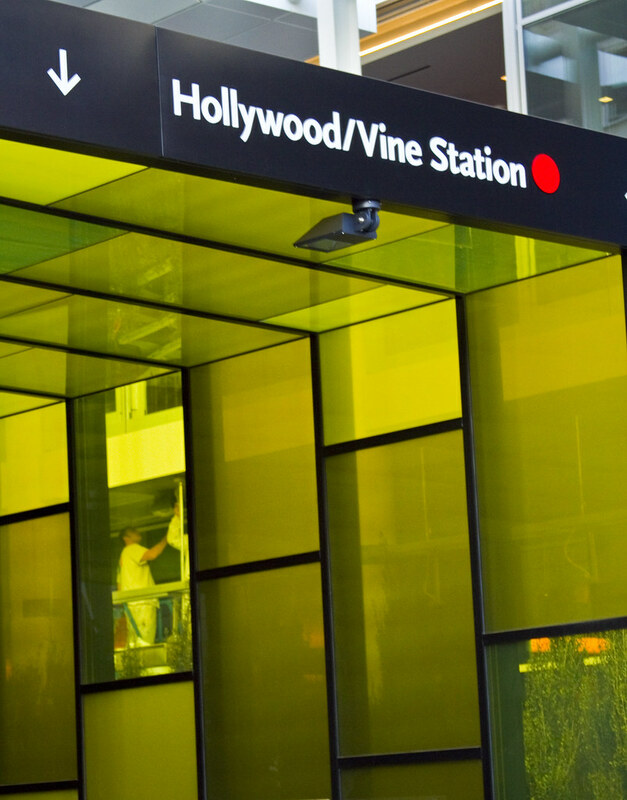 The Hollywood/Vine Red Line station is front and center at the new W Hollywood. 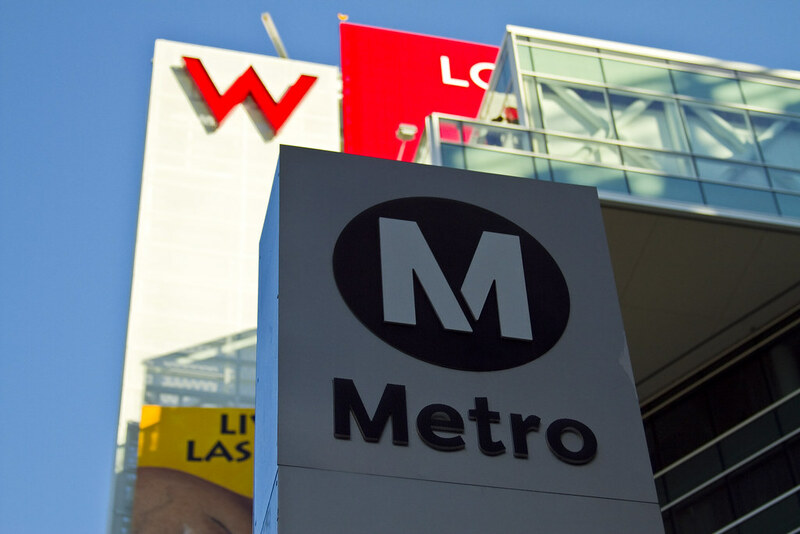 Today marks the opening of the W Hollywood Hotel at Hollywood and Vine, the latest project from Metro’s Joint Development Program, which seeks to encourage Transit Oriented Development (TOD) in Los Angeles. 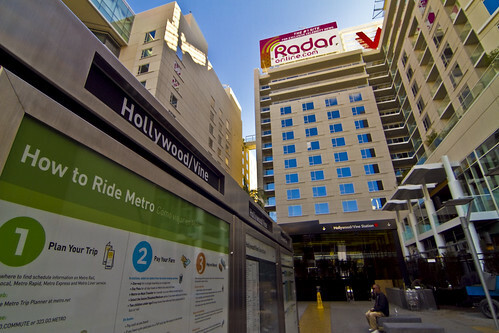 The 2.3- acre development sits right on top of the Hollywood/Vine Red Line station at the gateway of the Hollywood Boulevard Walk of Fame. In addition to the 305-room hotel, the development also includes 143 decidedly luxury condos (prices range from $800,000 to $6.5 million) and 30,000 square feet of ground-floor retail. Some of that ground floor space is already being taken up by the hotly anticipated restaurant Delphine and the adjacent — and aptly named — lounge, Station. The development also includes direct access to six Metro bus lines, including a Rapid line. Certainly, in terms of access, it fits the bill for a TOD. But is its transit accessibility being promoted? The redesigned subway portal is undeniably cool. Part of the development process included a redesign of the Hollywood/Vine Station entrance and plaza. The previous design, which paid homage to old Hollywood, has been replaced with a much more modern, and in my opinion, sexier design. Particularly striking is the new portal canopy which features yellow glass tiles of varying translucency that really creates a cool modern vibe. Beyond aesthetics, the redesign is functional, effectively creating a fantastic public space with ample seating and plenty of access to transit information. According to Metro staff involved in the redesign, much work was put into making sure the station entrance was unmistakeably visible from the street in order to adhere to the goals of TOD, and I’d say they’ve succeeded admirably. With the exception of an unfinished Metro pylon, the station entrance is unmissable. It’s front and center in the courtyard of the hotel and the yellow canopy and ample signage makes it impossible not to take notice. Even the bus stop on the corner of Hollywood and Argyle has been improved, with the addition of three stylish concrete bus benches and and overhead canopy. There's no lack of good signage at the redesigned station entrance. While the W Hollywood development seems to get a lot of things right when it comes to good TOD in terms of the physical space, things aren’t as improved on the promotional and marketing side of things. 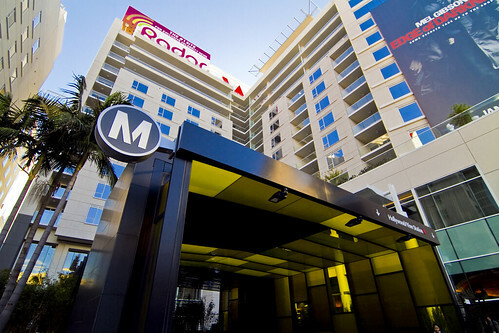 A visit to the W Hollywood Hotel’s website reveals nothing about the hotel’s transit accessibility, especially odd considering it’s built right atop a subway station and it was made possible due to a joint partnership with the local transit agency. Of course, driving directions from every point on the map are included. Metro staff tells me that after poor promotion of transit accessibility for Hollywood & Highland, a previous Metro Joint Development effort, language has been included in joint development agreements that require developers to actively promote the transit accessibility of their properties. Unfortunately, Hollywood & Highland still ignores the fact that they are right over a Red Line station (but they have no problem advertising “the BEST parking in Hollywood”) and it seems like the W Hollywood may be following suit. To be fair, the website for the W New York does not include transit information, but both the W San Francisco and the W Chicago websites include a section called “Transportation Options” that gives transit access information. It’s unclear what Metro’s Joint Development team is doing to enforce the agreement, but clearly including transit information is something the W has done before. 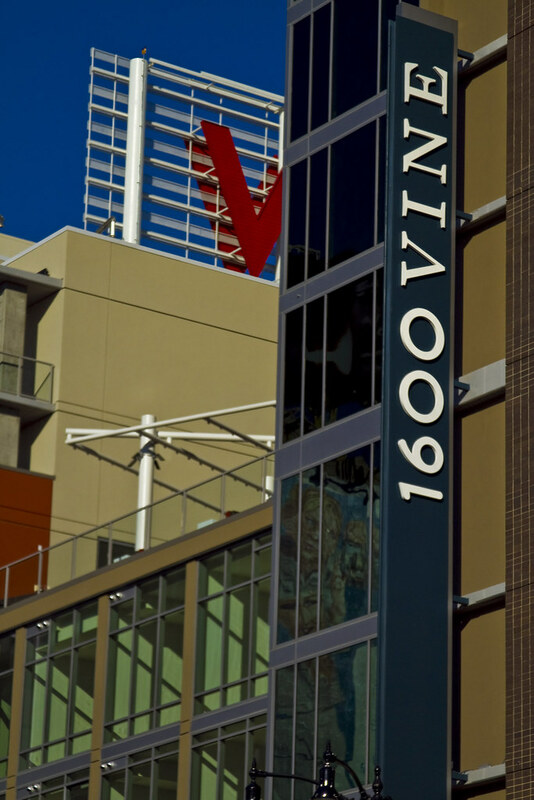 The 1600 Vine apartments are Metro accessible but that fact is poorly promoted. The W Hollywood Residences website does mention the fact that it’s atop a Red Line station, but that info is hidden deep within the site under a strangely named category, “Hot Hub.” There’s also the question of whether those who can afford million dollar luxury condos will ever set foot inside the subway despite its convenience. While there are no affordable housing units at the W Hotel Residences, down the block there is another project built in conjunction with the W — the 1600 Vine at Hollywood/Vine apartments — that does have affordable units. 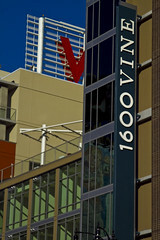 Unfortunately, the website for those apartments makes no mention of its proximity to the Red Line. What’s odd is that in a 2009 interview with Dwell Magazine, W Hollywood developer Marty Collins dismisses claims that residents of pricey luxury apartments won’t take the subway. In fact, Collins, who has a unit on the 3rd floor, claims to use the Red Line to get to meetings in downtown L.A. instead of driving. With such claims, it’s hard to believe the developer hasn’t invested more in promoting the property’s transit accessibility. The fact is, despite the current lack of promotion, this new Transit Oriented Development will invariably get more people to notice L.A.’s burgeoning transit system and that can only be a good thing. Another example of private developers and public agencies coming together to transform the region.